The Freckled Fox: A $200 Tiffany & Co. Gift Card Giveaway!! A $200 Tiffany & Co. Gift Card Giveaway!! Morning guys! 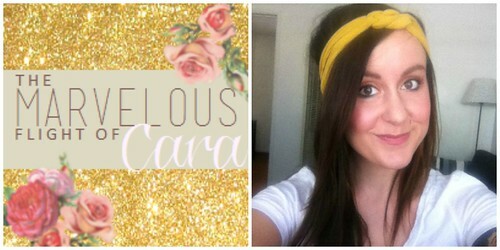 I'm taking a little break in the hair tutorials series to share a really fun giveaway with you! 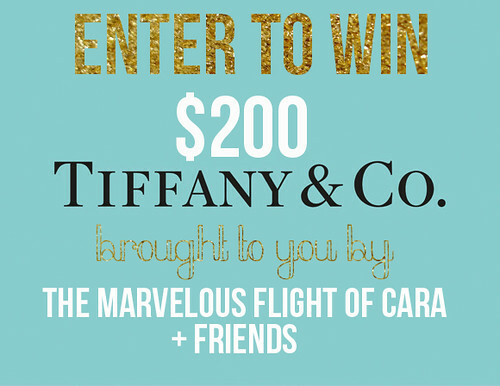 My friend Cara is celebrating a special anniversary with her husband this next week, and so I'm happy to help her in the celebrating along with lots of other amazing blogger friends by offering one of our readers $200 to Tiffany and Co! How cool is that?! Make sure you visit all the participants, and use all the entries you can, Tiffany & Co. is no giveaway to pass up! Hosted by: me! from The Marvelous Flight of Cara. definitely the Return to Tiffany™ mini heart tag in silver on a freshwater pearl bracelet! gorgeous! Is this open to your international readers? I'm loving the Tiffany locks! I would choose a charm or some earrings. I would choose the Tiffany Notes alphabet disc charm with my new married name initial! I would love to get the Atlas Dome Watch! If only! I would choose this ring! I love the star necklace. Thanks for a great giveaway! I would most likely pick the Paloma Picasso Love bracelet! I would order some Tiffany earrings! Pearls! I would love to get the cute silver ring with the Tiffany & Co logo! Gahh! I would pick the key heart charm. So cute! What a lovely contest! The Ziegfeld Collection Pearl Pendant is so timeless. . . love that one! there's a necklace I've been eyeing up for some time now - that would definitely be my first purchase! Ooooh I'd love the Tiffany twist bow ring! I'd buy the bead bracelet with pink heart! The Paloma Picasso Olive Leaf Band Ring is so gorgeous and unusual. Thanks for an awesome giveaway! I love the Paloma Picasso Olive Leaf Ring! Thanks for the chance! I love the Elsa Peretti® Doughnut ring in sterling silver. There is a pair of Toffany Locks butterfly sunglasses that I've had my eyes on! There is a pair of Tiffany Locks Butterfly sunglasses that I've had my eyes on! I would probably get a new "Tiffany" ring or a bracelet. So much to choose from! I'd get the Tiffany Twist clover charm in sterling silver! The 4 leaf clover necklace! I love the zip continental wallet! I'd choose something with a heart. I love hearts. I would go for the sterling silver horseshoe pendant necklace-it's perfectly classic and elegant! hmm maybe Tiffany locks. So hard to choose! Would love a initial pendant! I love the Aviator Sunglasses in Rose. Thanks for the giveaway!! Locket with a picture of my new baby! I love the 1837 Interlocking Rings so much, I think I'd just fork over the extra $50 myself to get it! I'd use it on the Tiffany Signature Square sunglasses! I love the dragonfly pendant! I would get the Paloma Picasso Olive Leaf ring!! Definitely a necklace for my mom! I would love to get the infinity pendant! Not sure what I would choose. Whatever I choose, would be handed down to both of my daughters, so I would have to get two items. Might just have them pick it out, so at least I'll know theyll like them when they are passed down! LOL. I'd choose the Tiffany Notes I Love You charm and chain. It's beautiful! I have ALWAYS wanted a genuine "Tiffany tag necklace" with the brand name on it...I really love the heart shaped ones. This will probably be my only opportunity to get one! Fingers crossed!!! I love the Tiffany locks!